To help ensure a safe arrival to you, the minimum number of chicks for each order prior to April 1st is 25. On and after April 1st, the minimum number of chicks required is 15. You can mix and match any type of baby chick in your order to reach the applicable chick minimum order. Our operators are happy to suggest complementing breeds if you need assistance. Salmon Faverolles are good-sized chickens with a beard, muff, feathered legs and feet, and fifth toe. 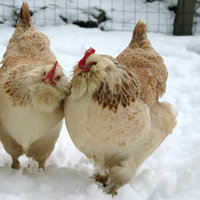 They are good in colder weather and lay medium-sized cream-colored eggs.